The California Environmental Quality Act has become a tool for groups to delay or kill a project – even if their beef doesn’t have anything to do with the environment. More than a decade ago, El Cajon residents packed City Hall. A developer wanted to convert a dilapidated, crime-ridden motel into a transitional center for homeless people. Residents feared it would draw more drugs and crime to their neighborhood and they told city leaders so. After the City Council approved the necessary permits anyway, a group that dubbed itself Citizens Concerned for El Cajon tried a last resort: the California Environmental Quality Act. The law, known as CEQA, requires governments and builders to reveal the potential environmental impacts associated with their projects and allows groups who aren’t satisfied with those analyses to sue, a dynamic that means outsiders can play a major role in shaping or delaying a project. Neighborhood groups, businesses and unions across the state have learned to wield the CEQA weapon. Sometimes their concerns are genuine. Sometimes they’re not motivated solely by threats to an endangered species or air quality. It’s almost never possible to gauge their true motives. Frustrated by city leaders’ actions in 2003, the El Cajon group cobbled together cash for a CEQA lawsuit. They accused the city of pushing through a project without a proper vetting of environmental impacts. A judge threw out the case six months later. “There is no evidence from which a fair argument could or might reasonably be made that any aspect of the proposed project will have any significant environmental impact,” Superior Court Judge William J. Howatt Jr. wrote. But even with the judge on its side, the homeless center was pushed to the brink by the delay. 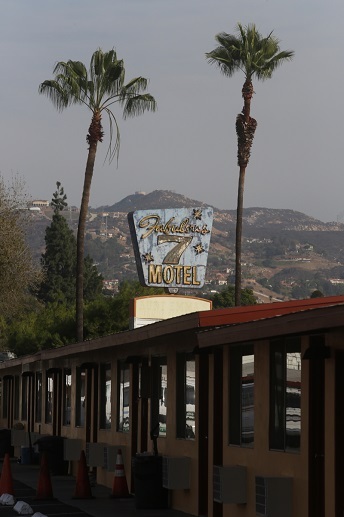 Its financial backers sunk about $4 million into a rundown motel with peeling paint and uninhabitable rooms. They held on for months, sometimes questioning whether they’d be able to open after all. By the time the litigation ended, the nonprofit that had been set to operate the center was out (the group said other factors beyond the CEQA suit also factored into its decision). It would be months before the center served the homeless. More than 11 years later, that old motel is freshly painted and filled with families and single adults participating in five programs. It’s now known as the East County Transitional Living Center and police say the drugs and prostitution that once ran rampant there are now history. A sun-bleached blue and gold Fabulous 7 Motel sign is one of the only reminders of the crumbling motel it once was. Pat Riley, who once managed the RV repair shop across the street and served as a spokesman for the group opposed to the homeless center, doesn’t regret his decision to pursue an environmental lawsuit. But he acknowledges their primary worries weren’t traditional environmental concerns. Riley said he and others feared for the safety of children and seniors who might encounter dangerous homeless residents. At the time, Riley said, the group became convinced CEQA was the most effective way to address fears that city leaders were being swayed by a powerful developer. “We needed to do something because we weren’t getting through to the mayor or the City Council or anyone else even though we were delivering petitions,” Riley said. Rick Preston, who allowed the El Cajon group to meet at the RV shop he owns, put it more bluntly. “If you’re short on power and influence and the good old boy weapons, you need to have your weapon,” Preston said. Riley believes the approach worked despite the judge’s ruling. It forced city leaders to listen to residents’ concerns. Harold Brown, CEO of the homeless center, doesn’t disagree. The group had originally envisioned a drug diversion program but ultimately decided against it. They opted to focus on serving women, children and single adults. And they reduced the number of available beds to 280, rather than the roughly 360 originally proposed. “I think we wound up with a program that did suit the community better,” Brown said. A CEQA suit made that happen, though the law itself doesn’t force project proponents to consider social or economic impacts unless there are also physical changes associated with a project. It’s a gray area of the law that a judge is often left to sort out. Yet Alpha Project CEO Bob McElroy, whose 28-year-old homeless services nonprofit was once involved with the El Cajon project, said nearly every local proposal involving the homeless faces CEQA threats from neighbors. He’s experienced it firsthand. Neighbors and environmental groups aren’t the only ones who turn to CEQA. Westfield, the owner of a Carlsbad mall at State Route 78 and El Camino Real, sued the city of Oceanside in 2008 over its approval of another shopping center four miles north. The company claimed city officials performed a “rushed and cursory” environmental analysis of the project. A judge later ruled the case was without merit. And Unite Here Local 30, a hotel workers union, has gotten involved in a handful of CEQA lawsuits in the last several years. In many cases, plaintiffs in CEQA cases have genuine environmental concerns. Other times, a case presents an opportunity to gain some leverage. Plaintiffs’ attorneys argue that reporting potential issues under CEQA is a positive exercise, even if the groups may seem to have ulterior motives. It forces the government and developers to address environmental concerns. Most lawyers acknowledge that controversial projects are more likely to get hit with lawsuits or threats, and say that more disclosure of potential environmental impacts is always a good thing. In fact, they say, stronger enforcement would be ideal. But since the state opted against creating an agency to police CEQA, those who bring lawsuits or seek environmental mitigation are doing the public a favor. Former San Diego Planning Director Bill Fulton, who literally wrote the book on California planning, is convinced many groups – from businesses to unions – have decided CEQA can be a useful tool to further their interests. This is part of our quest digging into the difficulties – real or perceived – of doing business in San Diego. Check out the previous story in our series, The Great Uncertainty Facing California Businesses, and the next, A Year of Big Wins for Business. Fact Check: Is Most Homelessness Tied to Drugs and Alcohol?